Don Mildrum '53 plans support for students studying his career field, engineering, and his life's passion, music. Don Mildrum '53 took up the clarinet in high school so he'd get into football games for free with the band. 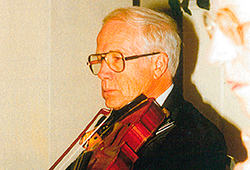 He also had played the violin since age 8, taught by his father. He had dreams of attending Juilliard and making his living in the music business. His father had different ideas, insisting that he major in engineering in preparation for starting a company together. "That was the ballgame right there," says Mildrum. He chose Lafayette over two other schools because he could also take arts and business courses (which proved valuable in his business career). While majoring in industrial engineering, he played gigs with small ensembles to supplement income from summer jobs that helped pay for tuition. He played the saxophone/clarinet for four years in the marching and concert bands. Under the popular director John Raymond, he learned much about singing and directing during four years in the College's choir, considered one of the top men's choruses at the time along with those of Yale and West Point. Mildrum did make his career in engineering - albeit without his father - including 12 years as chief industrial engineer/packaging engineer and 22 years in packaging machinery business sales. But he has spent much of his life making beautiful music wherever his jobs and retirement have taken him. He's sung and played the clarinet, viola, and violin as a member of ensembles in New York, New Jersey, Florida, Arizona, and California. One of the groups, the Masterwork Chorus in Morristown, N.J., is highly acclaimed by New York critics. Led by renowned conductor and musicologist David Randolph, it was the first chorus to perform at the Lincoln Center in New York City. "It was a lousy place to sing in before they fixed the acoustics," notes Mildrum. The group also sang many times at his favorite venue, Carnegie Hall. "It was fantastic, just unbelievable. The acoustics are so good that when you drop a pin on stage, you can hear it in the back of the auditorium," he says, recalling that a musician tested this during their first rehearsal there. "Singing there was awesome because of the history of the place and also because of all the famous musicians and singers who have performed there," he adds. "My grandfather, who was a lawyer, actually played on the same stage in the New York Philharmonic. Family tradition has it that he played at the opening of Carnegie Hall in 1891, which was conducted by Tchaikovsky." Mildrum sang for 10 years in the Masterwork Chorus and played viola for 17 years in the Livingston Symphony in New Jersey and for 10 years in the Charlotte Symphony in Florida. He also performed in pit orchestras and quartets. Today he belongs to a chamber ensemble in Arizona and sings in choruses, including a group that performs twice a month in nursing homes. He also teaches violin and viola. A member of Lafayette's Fleck Consistent Giving Society, Mildrum has supported both music and engineering in his donations to the College. He also dedicated a considerable percentage of his brokerage account in his will to establish the Donald R. '53 and Marilyn Lum Mildrum Scholarship Fund, which will benefit students studying either field. "I had some great experiences at Lafayette, and then there were the traditions. Also, I received a well-rounded education, and met some people who are still my good friends," he says. "I just thought it'd be good to help some kid who needs the money to get through college and have the same experiences."